Early morning, on the occasion of Rakhi Poornima, Ganapathi Homam and Sri Chakra Pooja were performed by Sri Sivanji and his assistant from Karumatra Matham. 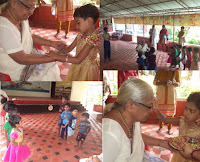 Ma.Didi tied Rakhi on the hands of Sishuvihar Kids and their parents.What Raksha Bandhan really means, was explained by Didi.This was followed by prayer and distribution of sweets. 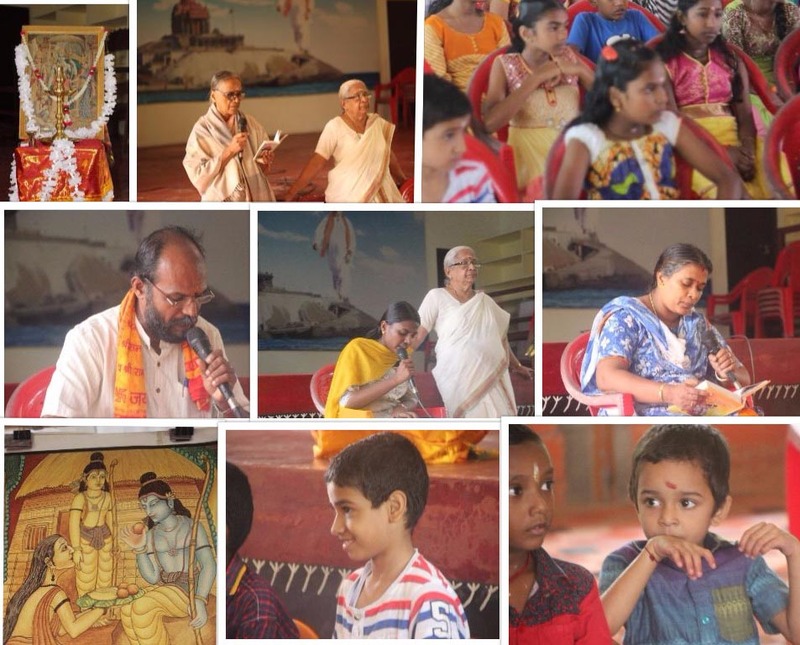 This time Independence Day celebration and concluding programme of Ramayana month was clubbed together. The National flag was hoisted by Ma.Didi. The tiny-tots of Sishuvihar along with their parents and inmates of Anandadham were all present. Samskar Varga children too had come to watch the hoisting. 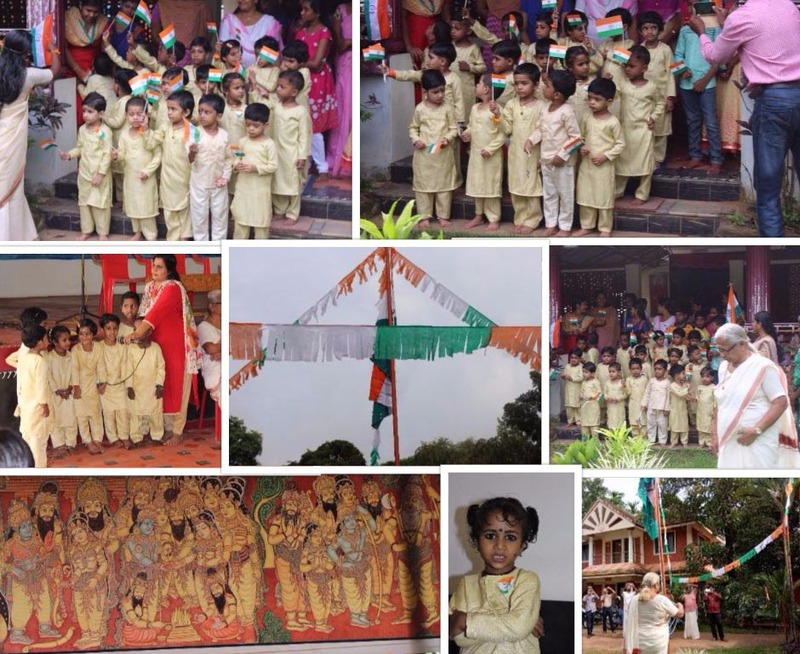 For all children, the best part of Independence Day celebration is when they receive laddoos after singing of National anthem Ma. Didi spoke to the children and their parents regarding the speciality and importance of attending the Independence Day celebration. 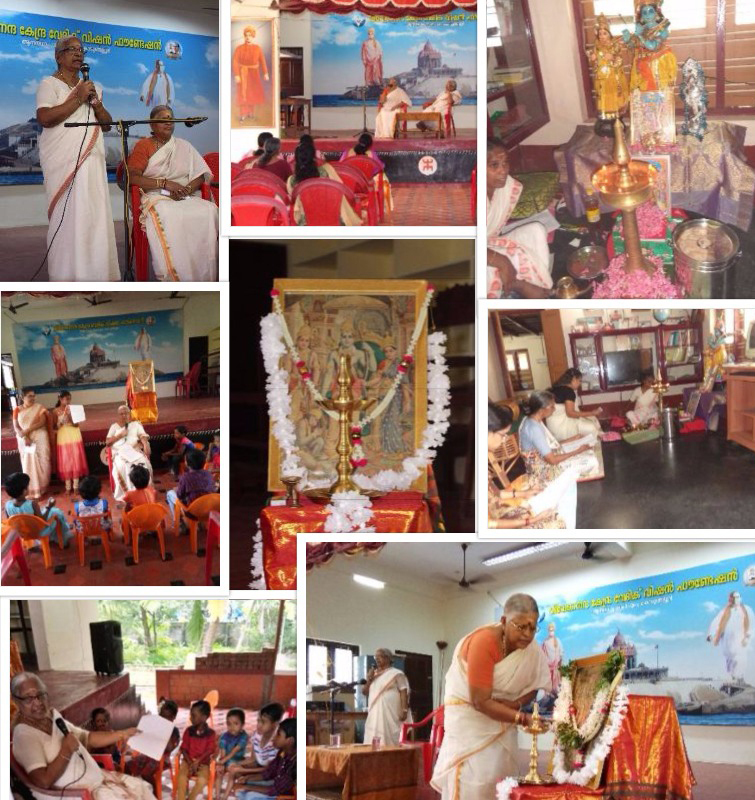 The next programme was at 10 a.m as a part of concluding of the Ramayana month, a talk on the need to know Ramayana was arranged. The talk was delivered by Prof. Shantha Kumari of Rashtriya Samskrita Pratisthan, Puranattukara, invited as Chief Guest. She started with the Karma Theory and how one is responsible for one's own karma. For example, Sita Devi was kept enclosed in Ashoka vanam because she had kept a pet bird enclosed in a cage. She stressed the importance of perseverance and contentment.She gave the example of Sumitra who received the yajna Prasad from both queens Kausalya and Kaikeyi because she showed no reaction when King Dasaratha forgetting her, divided the Prasad between the first two queens. With examples from Ramayana, she tried to convince the audience, the need for studying Ramayana and conveying the message to the next generation, in order to build up a healthy environment. Ramayana was conducted at Anandadham. It was in three categories. For the first category, it was an oral quiz for the children, right from Sishuvihar to the Samskarvarga group i.e. from UKG to class IX.The second category was kept as a detailed narration of all the 35 panels of the mural painting showing some of the scenes from Ramayana which was kept in the hall. This was for class XI and above including SKIE children. 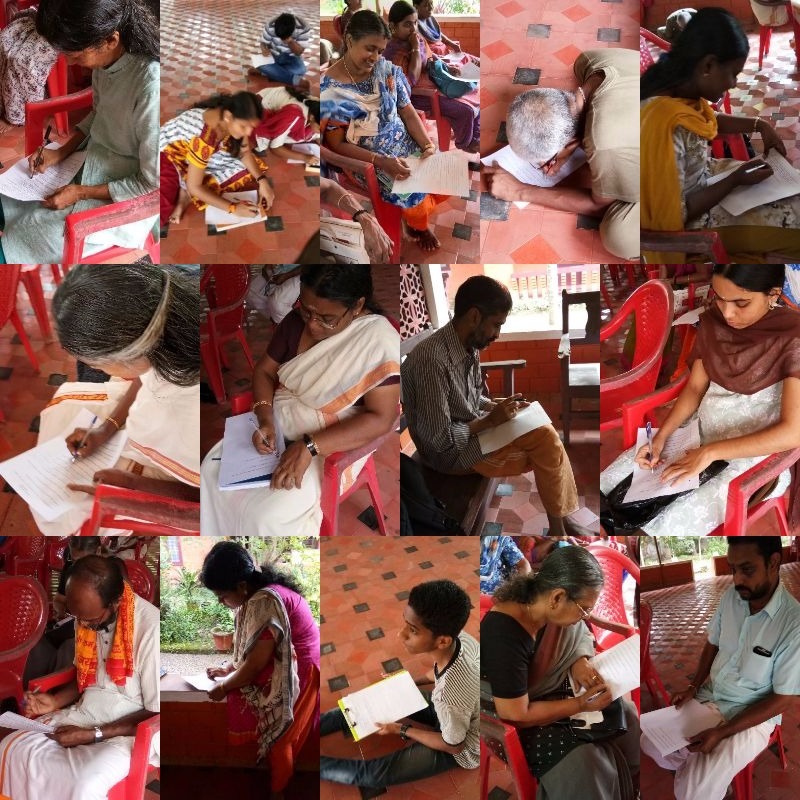 The elderly ladies and gents fell in the third category and they were given a questionnaire on the whole of Ramayana, which they had to answer in writing. Thus all people could participate. Master Abhiram of class III, Samskar Varga participant, won the first prize in the first category level I and Kum.Anushree of Class VII, Samskar Varga Shikshak, won the first prize from level II. Kum Drishya again Samskar Varga Shiksak, of class XI, got the first prize in the second category and Kum Bindu, Sishuvihar teacher and one behind popularizing Ramayana Parayana house to house during the Ramayana month, received the first prize in the third category. Ramayana parayanam was also kept for those who were interested in chanting from Adhyatma Ramayana. Prasad distribution was done at the end of the programme.